Turning the world of home heating upside-down. 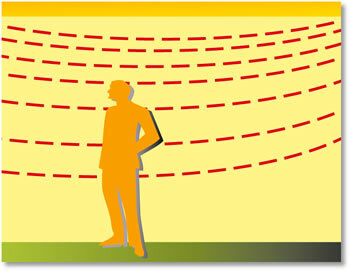 Using the principle of the sun's rays, we introduce Radiant Heated Ceilings - the heating system that heats from above. When standing in the shade on a cool day you feel as cold as the air about you. But stand in the direct sunlight and you feel an instant invigorating warmth as the sun's radiant energy in the form of heat rays flow over you, while the air remains as cool as in the shade. Using this principle of radiant heat, Radiant Heated Ceilings disperse rays throughout the room that warm the room's surfaces directly - without heating the air. No 'layering' of heat, and no stuffiness - ideal for sufferers of chest and respiratory complaints. Heat loss is minimal as the wavelengths produces are of a length that reflect off glass, so no energy is lost though windows. Radiant Heated Ceilings are uncomplicated, safe and clean. Constructed from fibrous plaster reinforced with pure glass strands, the ceiling panels are inlaid with low wattage heating cables that simply connect to the household mains supply. The heating cables gently warm the fibrous plaster to a point only slightly above body temperature. At this point the plaster produces the heat rays that warm the room. Maintaining the warmth is as simple as flicking the thermostat control switch. Most importantly of all, none of the materials in the Radiant Heated Ceilings support combustion - you can receive warmth and comfort with absolute peace of mind. Panectric Radiant Heated Ceilings are simple and inexpensive to install in any home, can be painted or textured, and light fittings mounted easily.